This page is a project development progress diary of a general game idea for a traditional Point and Click Adventure. The most recent posts are posted at the top of the page ending up with the first ever post at the very bottom. This page is intended to promote my general idea and use it to show others that might like to get involved in someway or another. I hope also some of the update content posted here, such as the timelapse videos, might help others who are like me new to working with pixel art and the particular genre of game design in general. TELEPORT ME TO THE FIRST POST PLEASE! More posters/adverts for the game world. I must admit I got somewhat distracted with these, so I'm done with these for now, but I am not sure how big this game world will be its likely I will make more on demand. The obligatory timelaspse vid! .... Don't forget to switch to 720p mode to see crisp video, any other quality under 720p blurs everything badly. Well here are some various posters I made that will feature in various locations throughout the game. I shall do many more of these in various sizes to fit better in other areas. Most of them will be random adverts, with some humorous aspects poking fun at the real world and past nostalgia. 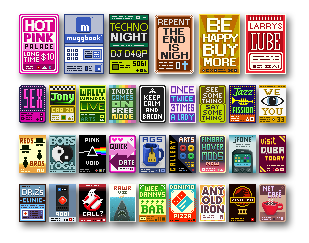 Some of the posters I will make, such as Larry's Lube(topia), will be specifically related to locations in the game. The player will be able to interact/view the posters by mouse overing them or clicking on them to bring up either more detailed information on whats on the poster (ie the small text).. and/or bring up a bigger version that's more readable. The bigger versions might work best with smaller posters, fliers or leaflets, since its very hard to represent readable text in such low res. And finally an update on progress with that street scene. As you can see I have started on the 2nd building now and a few more details here and there. Again this is the raw / un-photoshoped version so the final piece will have some shading, lighting, filtering.. and so on. Since the world setting will have a semi futuristic feel many of the vehicles seen in the game will be hover cars modified from modern/classic real life cars. I'm not sure I am happy with the look of this, but it's just one style idea for the hover modifications. 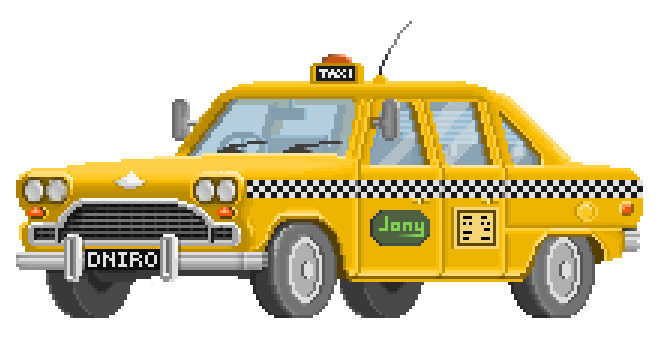 Oh Boy!, This Pixel Art Business Takes a lot More Time Then it's Simple Appearance. Still.... yes still on the first building.. Getting to a more final look now in terms of the raw image. 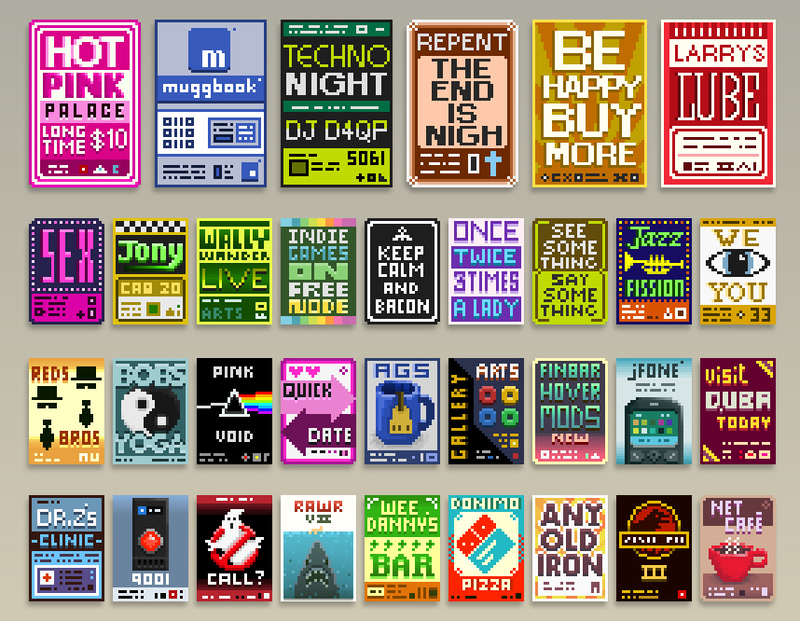 I'm slowly stating to realize how much work and care goes into pixel art. I`m pushing myself to put as much fine detail in as possible, so even this street scene is going to take MUCH longer then I thought. Details and some foreground assets so far. I haven't put any additional shading/texturing in Photoshop in this image other then a global screen tint. The timelapse of the street so far. I figured out a much better format of video to compress to before uploading to youtube that's a reasonable size for me to upload, so this video and most of the ones I do from now on will be much crisper with far less pixilation. Switch to HD 720p / Full screen mode to see the improved quality. Slightly more built up detailed scene, with better shading, touches of texturing, and various post fx added. Behold!... A walk in phone booth. The asset itself its made of up layers that make any background detail slightly visible through the layers of glass the booth has. This image shows how I separated each element to achieve this. This means I can use this booth anywhere else in the game and it will blend into any background better then not having transparent glass. The final booth may have additional layers so characters can walk inside the booth, and perhaps a layer for a shaft of light coming from the main light inside when its night time. Here are a few more global filtering / lighting / effects modifications on the original raw pixel art. 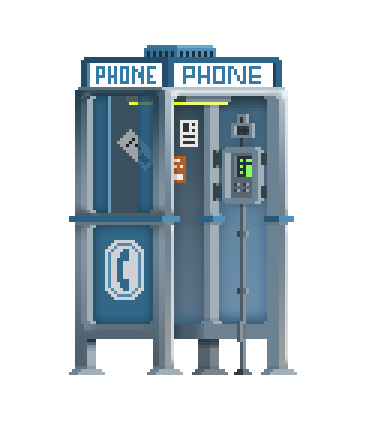 I have used an older version of the phone booth here with less details. Anyway these images are a good example demonstration on how applying a global filter tint can blend everything into the environment better. I did not apply additional texture and shading to the walls and other things, but the final thing will look better then even these example images. Here is original raw pixel art. With a simple global filter applied you can see it gives a nice soft finish. Same filter using different gradient, very easy to establish times of day, and atmosphere. Short Timelapse of me creating parts of the new robots. A couple of quick tests scenes to see how things are looking all together, and 2 examples of different lighting conditions using global screen filter/tinting, along with other post filtering and effects. The shop front featured in these 2 screenshots are at an earlier development then the image posted in Post #6. The idea here is to create the environments in such a way that there are key elements on different layers so the game might have dynamic lighting and mood changes, according to time of day or weather...etc.. I am not sure if AGS can work with layers in the way I'm thinking , but using AGS to make this game is just one option out of many in which this game can be built in. As a first significant piece of concept work I have set myself the goal of creating a sizeable street scene panoramic image which in the case of a game context could be used as a scrolling scene, or cut into smaller segments and used as rooms/screens beside each other. This street scene will feature the same horizontal offset angle of about 40 to 45 degrees, similar to the 2 cars I made previously. other scenes in the game may feature differing horizontal angles but the game will most likely always be locked on the vertical. Here is the goal I have set myself, you can see I have a long long ways to go to complete it as a concept street scene. "Some" detailing has been done on the far right building, so I'm going to work from left to right. This is the raw pixel art phase so there are no nice lighting effects, or shading. Click image to see actual size. 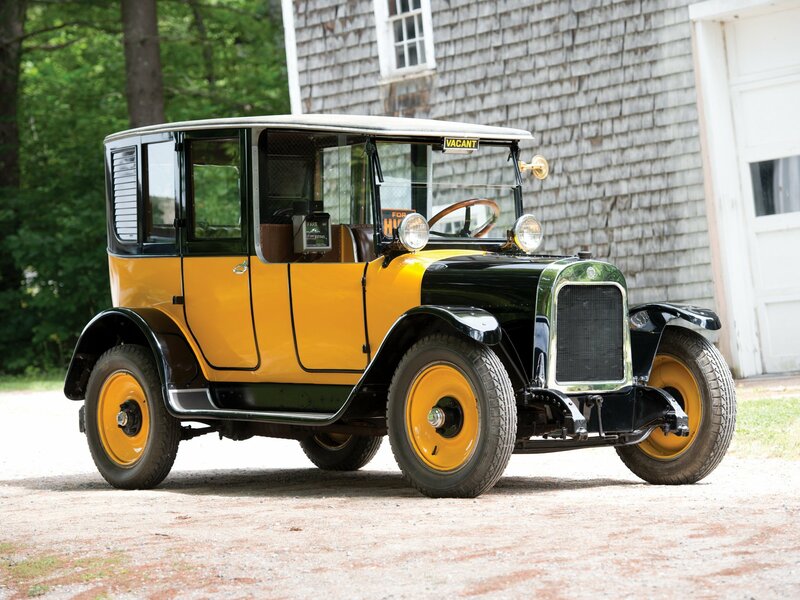 Another car, this one is a classic Yellow Cab Company taxi. This car may very feature in the game. I may at some point have the world with a mix of old (wheeled) cars and futuristic hover cars, So I could re-mix any car design I make pretty easy to be a hover car. Anyway, we`ll see where it goes. Creating the whole taxi from start to finish, minus the wheels where I forgot to unpause the timelapse capture software. Just a few other test images with no particular point or use., Download the images and zoom in using an image viewer to scrutinize the details,... Zooming with a browser tends to blur the image. After thinking about the first concept scene I made a bit more I am going to try out a different style, using more detailed/realistic pixel art, and this time not scaling anything up. I want also a consistent perspective that is easy to make consistent assets to place into without having to worry about offset angles. I had considered isometric, or completely 2d flat (like a platform game), but for now I am going to try an orthogonal perspective that will always be flat vertically, but some scenes will have offset angles horizontally. As a first test I created a vintage car. The method I used here was to find a nice photo for reference, scale it down to game asset size, using this I then trace some solid fills to establish its basic shape, from then on I use the original photo as a general loose reference and start to manually start adding in color, shading and the all important details. I think I am reasonably happy with the result here. Unfortunately I did not remember to timelapse this session. One major reason I have always been reluctant to even try to create a point and click adventure is the fact its likely I would need at some point or another have to create walk cycle animations to name only one type of animation sequence. I have had little to no experience with developing characters let alone animating them. The walk cycles in particular scare the wits out of me. The last time tried to do anything as exotic as a walk was many moons ago back when I was a wee nip in college, and I seem to remember it wasn't anything great to watch. Anyway, I pushed myself to at least try an early attempt at a walk cycle and here it is in all its glorious shittyness... well to be honest I don't think its "that" bad, for a pretty much first time attempt. I shall strive to get better with this and if I cant I'll consider getting some help with the animations on characters specifically. 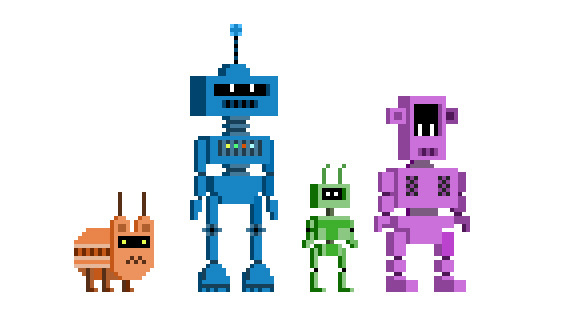 I have created 4 robot characters, in a minimal blocky pixel art style. These guys might be a family. 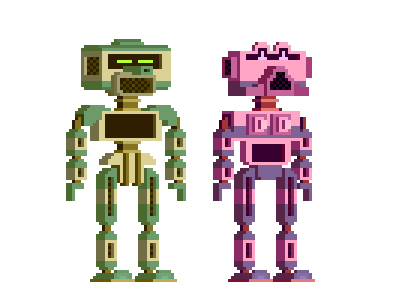 These designs are pure pixel art, so my fist idea is to scale them up 500% so i can apply nice shading and other effects but try to maintain the pixel art style. 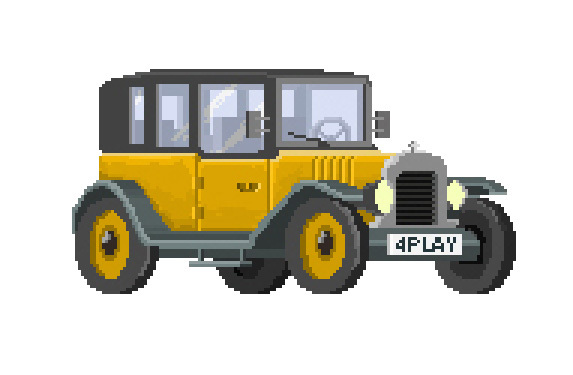 After bringing the raw pixel art into Photoshop, scaling up and applying various shading. This is the first style idea. They wont be as big on screen in game of course. Working in a higher resolution also means I can use smooth tweening animation on things rather than have to paint raw pixel art frames one by one. 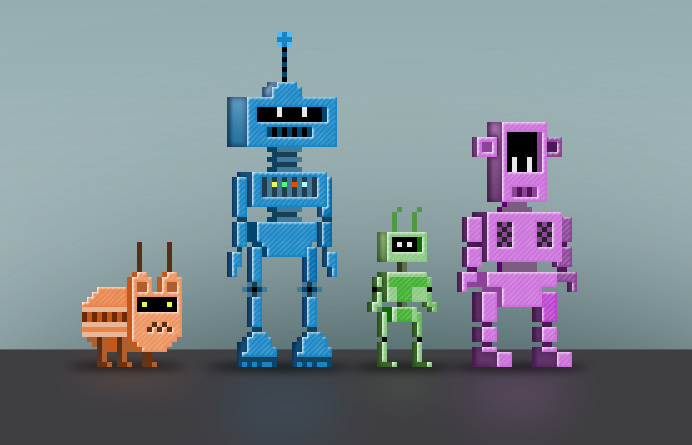 Here is an early mock up screenshot of the characters set into a scene. 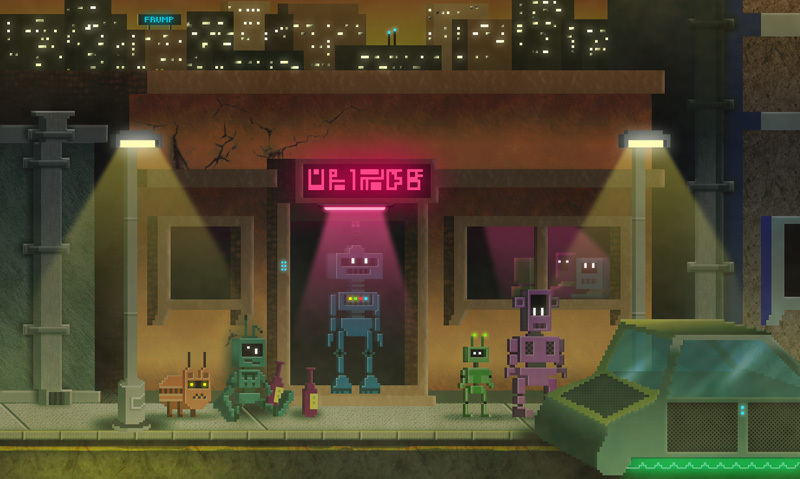 To make this street scene I used the same method as before, creating raw pixel art, then scaling it up to apply better shading, lighting and general add more detail and mood but keeping the assets looking pixel art. You can see me create the whole scene in the timelapse video below. After doing this I am not entirely sure I like the style. There are a number or potential issues the main one being there are a mix of vanishing points that will be hard to work around in other scenes. So I am now thinking of another style completely, but keeping to a similar style of characters. Although there is so much more detailing I wanted to add to this first concept (i mean just look at that nasty car thingy) I am going to abandon it try to establish some other style. All ya`ll might wanna get used to these timelapse videos, I do a lot of them. I might apologies in advance for the poor compression quality this is due to a combination of internet upload issues and global warming. And for reference in most of the timelapse videos I will be featuring are captured at 1 screenshot every 5 seconds. The video is exported playing 30 of those screenshots every second. Do the math!. I have learned quite a bit from watching timelapse videos for various areas of design, if you find the video is playing back too fast then you can download a player called "Media Player Classic" (its free) and you can control play back speed with that. One of my favorite type of games through the years has been the good old classic traditional point and click adventure games, in particular at the height of the Lucas/Sierra era. 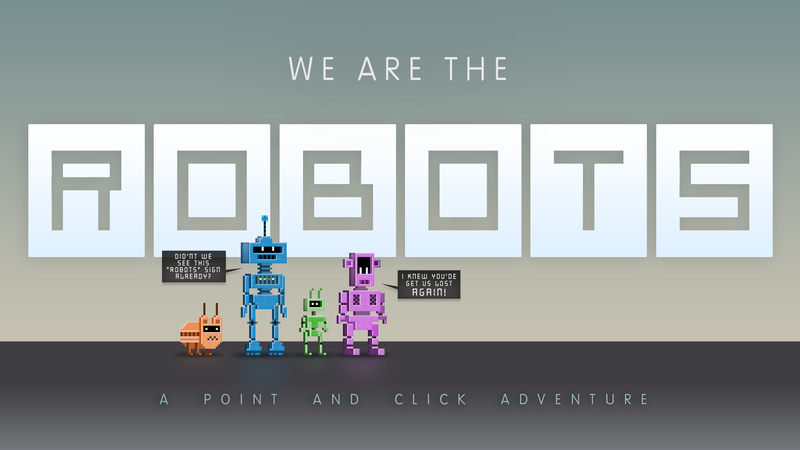 I have always wanted to make an adventure of my own though my lack of programing ability has always stood in the way. I produced graphics for various game concepts in the past (not specifically adventure games) and most recently have produced graphics for a mobile game that was actually released into stores last year. I am now ready to start working on a new project and I thought its about time to look at doing what I've always wanted to do, a point and click adventure game. I have been partly encouraged to do so by seeing the wonderful work being produced by the AGS community (Adventure Game Studio) in particular over recent years, proving that traditional adventure games are very much still alive. Its great to see so many people keeping the genre alive. I have been extremely impressed with such high end games such as Gemini Rue, The Blackwell Series, Primordia, Resonance..etc and most recently Shardlight, and of course the classics such as Beneath a Steel Sky, The Dig, Universe, Fate of Atlantis, Monkey Island, Day of the Tentacle...and so on. I have also been Inspired and encouraged by the creator of "Tales from the Eureka Cluster : The Abtyon Case" of whom I personally know. The basic idea for the adventure is at this early stage a "world idea" rather then any fleshed out story. The game will take place in a world where only robots exist, a sort of semi futuristic cyber punk world with with relevance to retroism from the 60s, up to to the 2010+. The game will mostly take part deep in large run down area of a sprawling metropolis and will look for the most part like its modern equivalent, but featuring futuristic and old tech. I'm not sure how this mix is going to work out but I`ll try to establish a general aesthetic and work on from there. In terms of the scenarios that could take place in this world I have been very much inspired by Futurama, but without any humans, aliens and a little more down to earth and current modern. And like Futurama this game will be as humorous as possible, covering serious issues in a comedic fashion, also a lot like the humor found in traditional point and click adventures of old and new. At this early stage I am not even sure of a consistent style so my first few posts on this site will no doubt be experimenting with different styles trying to establish a consistent style and work flow. My initial idea is to have many of the elements in a pixel art style but have the game in HD and using HD filtering/post effects/shading.. etc ... However I may just go with a straight pixel art style, or even a pure HD (non - pixel art) in some other style. My heart is set on using pixel art though since its an area of art/design I have not really had much experience with and want to get familiar with work with. Using pixel art also will make the game feel more authentic in context of the nostalgia these traditional pixel art style adventures often invoke with me.